At the center of the painting is a triangle with a circle in the middle. The triangle is divided into three equal parts, which are colored green, purple and orange (secondary colors). The purple represents Christianity, the green, Islam and the orange, Judaism. The triangle is a symbol for God. The center circle indicates the Infinite Potential, or the all-encompassing, indefinable totality of God. The three separate parts of the triangle signify the anthropomorphic aspects of the eternal God that each of the religions of the West identifies with and worships. The men at the lower part of the painting each have green shields, which identify them as Muslims. In the middle of the painting, the men with orange shields are the Jews and the men with purple shields are the Christians. There are only four orange shields because there are only about twenty million Jews compared to two billion Christians and one billion Muslims. The religious soldiers are marching on the coffins of the dead Christians, Jews and Muslims who have been killed in holy wars for the last two thousand years. The red surrounding both the coffins and the triangle is the blood of the many religionists who have been killed in holy wars. In the center of the painting, surrounding the triangle, are human eggs and human sperm. These eggs and sperm illustrate the multitude of unborn children of the religionists who will be born and will potentially die in the blood of the holy war. Surrounding the circle of soldiers of the three Gods is a black circle, representing oil. It is the oil in the Middle East that continues to fuel the holy war that exists there. The black oil rises and surrounds the buildings in the city at the upper left of the painting. This exemplifies Western Civilization's dependence upon oil in the past, present, and future. In the upper right hand corner is the symbol of WorldPeace. It is a red hand, which represents mankind and a green and blue yin-yang symbol, which represents the ever-changing earth. 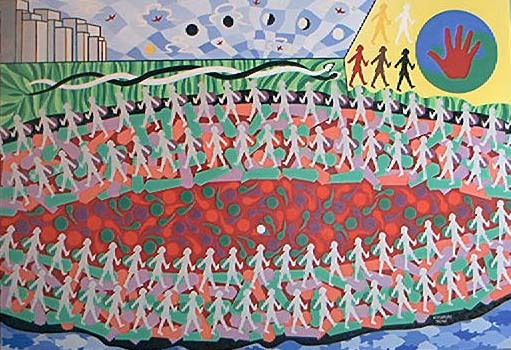 To the left of the WorldPeace symbol are five figures, which represent the races of man who oppose WorldPeace; red, yellow, black, white and brown. The men have no shields because they do not need to defend themselves from WorldPeace. Their singular goal is to keep WorldPeace isolated, thereby keeping it from infecting all of humanity. War is, in reality, one human being murdering another human being. individual human beings who do the actual murdering and the dying. human being murdering another human being. sorrow. How can this be acceptable to anyone? Powerful nations murder because they think they can get away with it. social disagreements is tragically laughable. physical location of one's home? of war is always more war. can never justify the great tragedy of humanity murdering itself. children, will be murdered by anyone else.